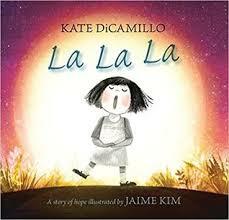 Kate DiCamillo's tales inspire love, loss, hope and courage. She has the ability to connect with all ages and this almost wordless picture book is no different, taking readers on an emotionally satisfying journey as a little girl roams the landscape longing for a new friend. 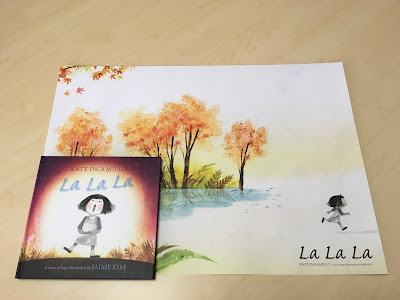 Thanks to our good friends at Walker Books Australia and to celebrate Kate DiCamillo's first picture book in ten years, we have 10 incredible prize packs of La La La: A Story of Hope to giveaway. Each pack consists of a poster featuring a scene from Kate's new book plus a copy of the book. To win this amazing prize, simply tell us in 25 words or less what your favourite thing is to do alone. Email your answer along with your name and postal address to Dimity. The response we like the best will win one of the ten packs. Competition is open to anyone, worldwide, so long as they have an Australian postal address for delivery of the book. Please note, we cannot deliver to PO Boxes. Entries without a name and street address will be ineligible. Winners will be announced right here on our website on Saturday 21October 2017. Competition runs from 5am Friday 13 October to 5am Friday 20 October 2017. Adults can enter for those aged 17 and under. This is a game of skill, not chance. The judge’s decision is final and no correspondence will be entered into. Visit again for our review of La La La: A Story of Hope on 23 October 2017 by Sarah.